Golf travels to Pine Hills in Cordele today to take on Crisp Co. Tee time is at 4:00. Golf travels to Southern Hills to take on Hawkinsville this afternoon at 4:00. 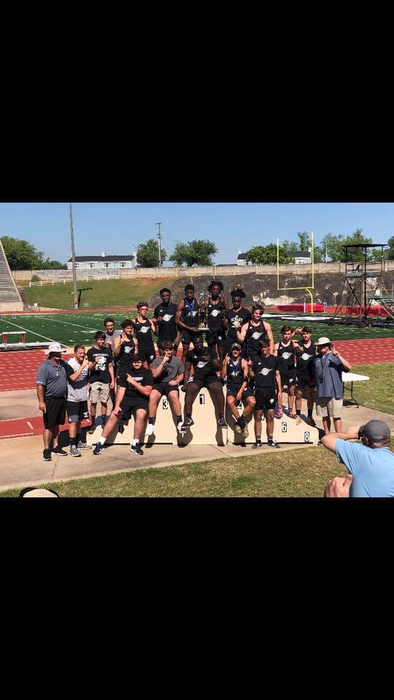 Our boys track team finished first in area today. Our girls finished second in a very close and competitive field. Several of our boys and girls have advanced to State completion on May 9-11. Seniors don’t forget to get your banquet tickets for next Tuesday’s Sr. GHSA banquet. Pick up your ticket at any time and you may purchase up to 3 additional tickets for $10 each starting today. Varsity track travels to Hugh Mills Stadium in Albany today for the area track meet and an opportunity to qualify for state. The baseball game scheduled at Brookstone today has been rained out and rescheduled for tomorrow at 1:00. Congratulations to our REGION CHAMPIONS!!! JV baseball travels to Roberta to take on Crawford Co today. First pitch is at 5:30. Golf travels to Riverpointe Golf Club to take on Lee Co. today. They will tee it up at 4:00. Varsity golf will play a split squad today. Some travel to Southern Landings in Warner Robins for the Bear Invitational and others will host Taylor Co. and Upson -Lee. 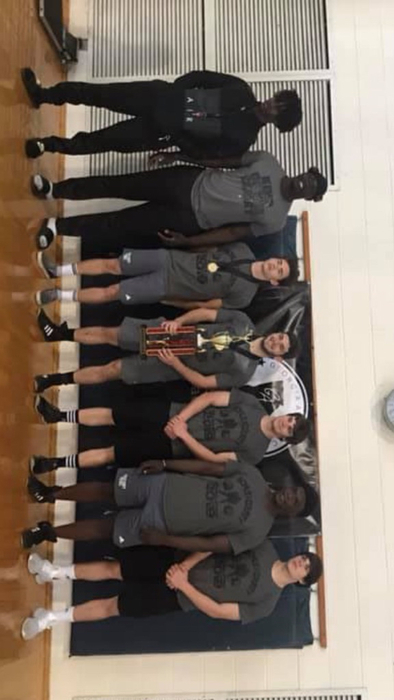 Congratulations to the boys track team who won Region for the third straight year and the girls for finishing second at the region track meet today in Fitzgerald. Varsity Track travels to Fitzgerald for the Region Track meet today. The JV and Varsity Wildcats host Westfield School today. JV begins at 4:00 and Varsity will begin around 6:15. The Wildcats host St. Anne-Pacelli today at 5:30. Sr. Night festivities will begin around 5:00. #1 Baconton Charter comes to town to take on our #2 ranked Wildcats for a DH today beginning at 4:00. Senior Athletes please remember that your Sr. plaque information sheet is due to Coach Theiss tomorrow. Also spring sports seniors remember to get your Sr. night information sheets to him as well. Varsity track travels to Macon today for a meet at Stratford. Action starts at 3:30. Varsity baseball travels to Roberta to take on Crawford Co. today. First pitch is at 4:30. Today’s varsity baseball game at Crawford was rained out. It has been rescheduled for tomorrow Wed. 4/10 at 4:30. Due to weather concerns the JV game at Crawford Co. today has been postponed. Varsity will still play and start at 4:30. JV and Varsity baseball travel to Roberta today to take on Crawford Co. JV first pitch is at 4:00 and Varsity will begin around 6:15. Golf travels to Southern Hills today to take on Hawkinsville at 4:00. 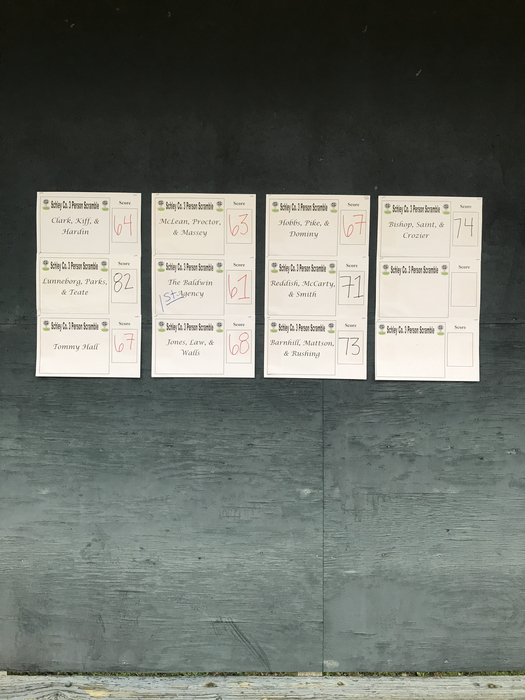 Thad Clark finished tied for second in yesterday’s tournament at Idle Hour. He shot a +2 72. Varsity baseball hosts Taylor Co. today. First pitch is at 5:30. The boys golf team travels to Idle Hour in Macon for the Stratford Invitational today. Tee time for the morning flight is 8:30. JV and Varsity baseball host Manchester today. JV first pitch is at 4:00 and varsity will begin around 6:15. Varsity golf hosts Lee Co. and Mary Persons at Griffin Bell in Americus today. Tee time is 4:00. JV baseball hosts Lee Co. in a DH today beginning at 4:00. Varsity track travels to Hugh Mills Stadium in Albany today for a meet beginning at 2:30. JV and varsity baseball travel to Cordele today to take on Crisp Co. JV first pitch is at 4:00 and varsity will begin around 6:15. MS track hosts their final meet of the season today. Don’t miss your last chance to see them compete. Golf hosts Hawkinsville and Crisp Co today at Griffin Bell in Americus. Tee time is 4:00. Varsity Track travels to Deerfield in Albany today for a meet beginning at 3:30. MS baseball travels to Lanier Co. today for the second round of the region playoffs. First pitch is at 4:30. Varsity baseball travels to Middle GA State in Cochran today to take on Johnson Co. First pitch is at 5:00. MS track hosts Marion Co., Taylor Co., and Central today for a meet starting at 3:30. JV baseball travels to Lee Co. today for a DH beginning at 4:30. Golf travels to Raintree Golf and Country Club in Thomaston today for a tournament beginning at 2:00. Congratulations to Savannah Varnum and Madelyn Dunston for winning the state championship in Duo Oral Interp. at today’s Literary state competition. Congratulations as well to Ethan Ethridge who finished second in Humorous Oral Interp. The Wildcats host Brookstone in a big region game today. First pitch is set for 5:30. Varsity track travels to Kinnett Stadium in Columbus today for a meet beginning at 4:00. The Middle School Baseball games vs. Dooly Co. tomorrow have been cancelled tomorrow. Playoffs start on Monday. Stay tuned for details. Middle school baseball hosts Lee County today. First pitch is at 4:30. MS baseball hosts Pulaski Co. at the rec. dept today. First pitch is at 4:00. Golf opens their season today against Stratford and Taylor Co. at 4:00. 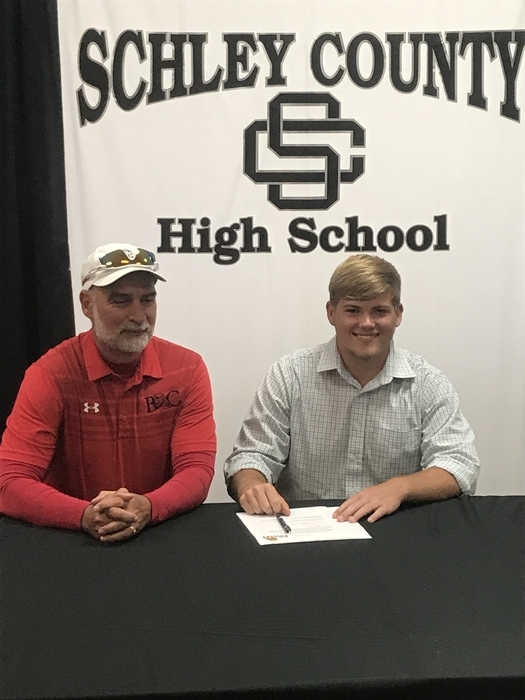 They will play at Griffin Bell Golf Course in Americus. MS track hosts a meet today beginning at 3:45. JV and varsity baseball travel to Hawkinsville today. JV first pitch is set for 4:00. Varsity will begin around 6:00. The golf tournament today at Lee County has been cancelled. Stay tuned for a reschedule date. Golf travels to Riverpointe golf club for the Lee County Invitational today. Shotgun start at 1:55. Varsity baseball travels to Baconton Charter today. First pitch is at 4:30. JV and Varsity baseball travel to Perry today for a DH at Westfield. JV first pitch is at 11:00 and varsity will begin around 1:00. JV and Varsity baseball travel to Marion Co. today. JV first pitch is at 4:00, Varsity will begin around 6:00. JV baseball travels to Forsyth this afternoon to take on Mary Persons in a DH. Game one first pitch is at 4:00. Varsity track travels to Barnesville today for a meet at Lamar Co. beginning at 3:30. Middle School Baseball travels to Wilcox Co. for a DH today beginning at 4:00. MS baseball hosts Irwin Co. today. The game will be played at the rec. department. First pitch is at 4:30. MS track hosts Staley and Southland today beginning at 3:45. Admission is $5. JV and Varsity baseball host Crawford Co. today. JV first pitch is at 4:00 and varsity will begin around 6:00. Varsity baseball travels to Taylor Co. this afternoon for a 5:00 first pitch. The Middle School Baseball game today has been cancelled. It will be played as part of a DH at Wilcox Co. on Thursday. The JV game tomorrow vs. Taylor Co. has been cancelled. Varsity first pitch will now be at 5:00. There will be a $5 charge to get into the track meet today. JV and Varsity baseball hosts Crisp Co. in a DH today. JV first pitch is at 4:00 and the Varsity will begin around 6:00. MS baseball travels to Hawkinsville to take on Pulaski Co. middle school today. First pitch is at 4:00. Varsity baseball hosts Dooly Co. in a DH today beginning at 4:00. The Irwin Co. MS baseball game that was moved on Wednesday will now be played at home on Tuesday March 5th. It will be played at the rec department due to a varsity game being on our field that day. The varsity track meet tomorrow at Brookstone has been cancelled. Tomorrow's MS baseball game vs. Wilcox Co. has been moved to Monday 3/4. MS baseball travels to Ocilla to take on Irwin Co. today. First pitch is at 4:30. JV/Varsity baseball hosts Hawkinsville today. JV first pitch is at 4:00 and Varsity will begin around 6:00. The MS baseball game tomorrow will not be a home game and has been moved to Irwin Co. First pitch will be at 4:30. The baseball games scheduled for today have been cancelled. Stay tuned to the app and twitter for updates. Thanks to all who came out to our first annual golf scramble to benefit CC, golf and track. Thanks to our sponsors , TSGResolute, Rodney and Vanessa Wall, The Baldwin Agency, Judd and Brandi Conner and Myra and Harold Chavers. Reminder: the fundraising golf tournament is today. 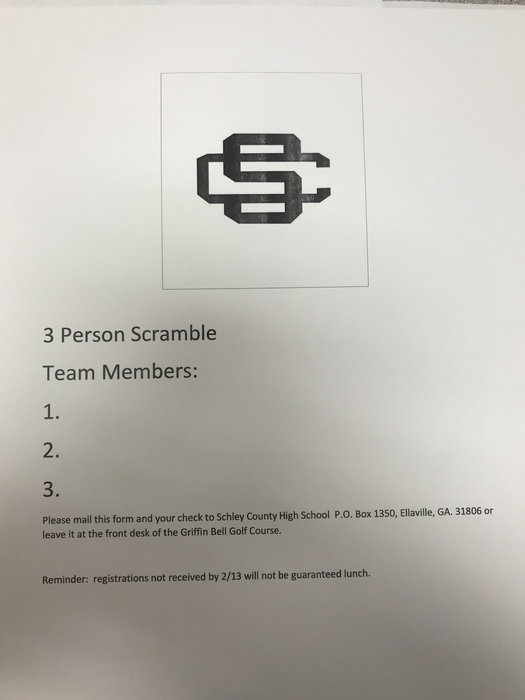 3 man scramble, $150 per team, lunch at 11:00, shotgun start at 12:00. Come support your cross country, golf and track teams. The Wildcats lose a heartbreaker to Clinch Co. 53-52. Great season guys. At the end of the 3rd quarter we have knotted the game at 37-37 here in Homerville. At the half the Wildcats trail Clinch Co. 29-22. We have got to go get them in the second half. At the end of the first quarter the Wildcats trail Clinch Co. 14-11. Reminder: the Wildcats travel to Homerville today to take on Clinch Co. in the first round of the basketball playoffs. Tip-off is set for 6:00. If you can’t make it plan to listen on 94.7 or 98.7. Congratulations to Richie Quiroz on his 7th place finish today at the wrestling state championships. MS baseball host Crawford Co. today. Good luck to Mia Kelley and Richie Quiroz as they wrestle at state starting today. The playoff brackets are set. The Wildcats will travel to Clinch Co. on Saturday Feb. 16 for the first round of the basketball playoffs. Tip-off is set for 6:00 pm. MS baseball opens their season today at Crawford Co. First pitch is set for 4:00. Mia Kelley and Richie Quiroz qualified today for the state wrestling tournament next week in Macon. I doing so they became the first two in school history to wrestle at state. Great job to coach Smith and all of our wrestlers. The baseball team fell to Cook Co. in their scrimmage 10-8 tonight. Baseball season opens today as the Wildcats host Cook Co. for a scrimmage beginning at 5:00. The Wildcats fall to Manchester 55-42. Now we wait to see where we play next week in the first round of the playoffs. The lady Wildcats fall to Greenville 70-46. We now wait for final power ratings to determine whether we will be playoff bound. The Wildcats travel to Dooly Co. this afternoon to compete in the quarterfinals of the region tournament. The girls play Greenville at 4:00 while the boys play Manchester at 5:30. 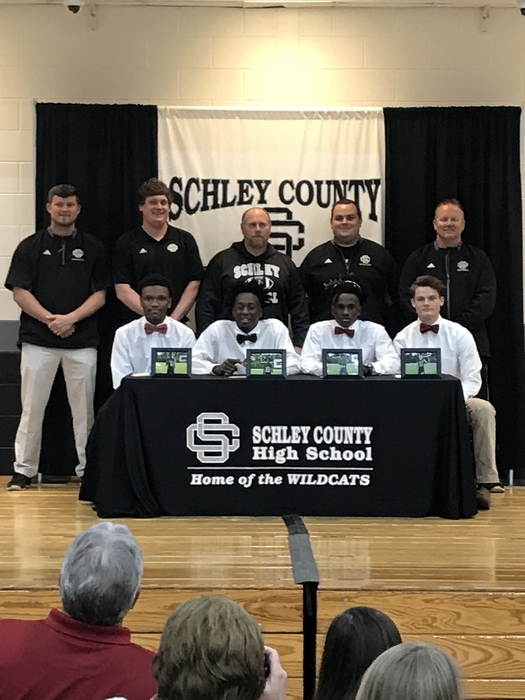 Four of our football players signed their national letters of intent today. Sampson/GMC, Napper/Reinhardt, Williamson-Hart/Columbus State, Sellers/Lagrange. The girls and boys both advance to the quarterfinals of the region tournament with wins over Crawford Co. The girls play Greenville on Thursday at 4;00 and the boys play Manchester on Thursday at 5:30. 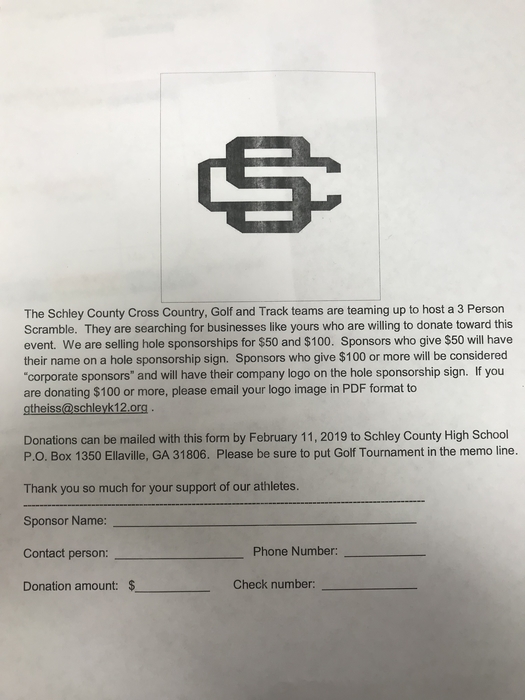 Both games will be at Dooly Co.
Don’t forget to get your teams entered in the golf tournament and sponsor a hole. The tournament is at 11:00 AM on Feb 18. You can register the day of but to be guaranteed lunch you must register by 2/13. Wildcats win!!! The Lady Wildcats and Wildcats will each host Crawford Co. tomorrow night in the sub region tournament. Girls begin at 6:00 with the boys to follow. Tickets for the Sub-Region Tournament will be $8 and not booster club passes can be accepted. Only GHSA approved passes will grant admittance. The Wildcats host the Subregion basketball tournament tonight. Games begin at 4:00. The lady Wildcats play Taylor Co. at 7:00 and the Wildcats play Hawkinsville at 8:30. Schley Wrestling placed second in team points at area with eight qualifying for the sectional tournament. 4th place finishers were Peter Horton, Gage Hart, Brandon Collins, and William Hardin. 3rd place finishers were Landon Dailey and Dywon Hamilton. Second place was Aaron Pinckard and Schley County’s first ever area champion is Richie Quiroz. 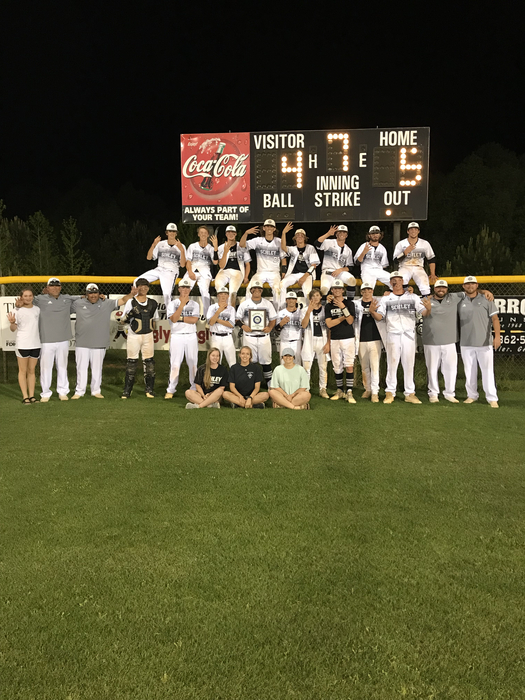 The Wildcats will host the Sub-Region tournament on Monday and Tuesday. Games Monday start at 4:00. The girls will play Taylor Co. at 7:00 and the boys will play Hawkinsville at 8:30. Wrestling travels to Tattnall Square in Macon tomorrow morning for Traditional Area. It all begins around 8:00 am. Join us for Sr. Night tonight between the Varsity Basketball games around 7:15-7:30. Hawkinsville comes to town, JV girls tip-off at 4:30, Varsity girls tip at 6:00 and Varsity boys tip around 7:30. The JV girls game today has been cancelled. Varsity will play as scheduled; girls will tip at 6:00 and boys will tip around 7:30. Basketball travels to Macon Co. tonight. JV girls tip-off at 4:30, varsity girls tip at 6:30 and varsity boys tip around 7:30. Basketball travels to Manchester today. JV boys tip-off at 4:30, varsity girls at 6:00 and varsity boys around 7:30. Basketball hosts Dooly Co. today. JV boys tip-off at 4:30, Varsity girls tip at 6:00 and Varsity boys will tip around 7:30. JV Girls and Boys basketball travel to Pataula Charter today. Girls tip at 12:30 and the boys will tip around 1:30. The Wildcats defeat Central-Talbotton 56-51. Lady Wildcats fall to Central-Talbotton 54-47. Boys warming up. Basketball hosts Central-Talbotton today. JV boys tip at 4:30, Varsity girls tip at 6:00 and Varsity boys tip around 7:30. Wrestling this afternoon has been cancelled. Basketball travels to Taylor County tonight. Varsity girls at 6:00 and varsity boys around 7:30. Wrestling travels to Americus-Sumter today for a match beginning at 5:30. Wrestling competes at Area Duals tomorrow at Brookstone in Columbus. It all kicks of at 8:00 am. Basketball travels to Brookstone today. JV Girls begin at 3:30 with boys to follow. Varsity girls will tip around 6:00 with boys to follow. Wrestling travels to Lee Co. today. Matches begin at 6:00. Basketball travels to Roberta to take on Crawford Co. today. JV boys tip at 4:30, Varsity Girls tip at 6:00 and Varsity boys tip at 7:30. The Wildcats defeat Brookstone 57-45. The Lady Wildcats defeat Brookstone 44-42. The Wildcats host Brookstone today. JV Boys begin at 12:30 and Varsity games will follow. JV girls and boys fall to Marion Co. Varsity girls are warming up. The Wildcats host Marion Co. today. JV girls begin at 3:00 with JV boys to follow. Varsity girls will tip between 5:30 and 6:00 with varsity boys to follow. Wrestling travels to Smiths Station in Phoenix City today for a match beginning at 1:30. Happy new year to all of our fans. If you think 2018 was good, wait until you see what 2019 holds. Come on out to the Christmas Tournament today. Games begin at 1:00, gates will open at 12:00. The Wildcats will take on Chattahoochee Co. at 4:00. Come on out to the Christmas Tournament today. Games begin at 1:00, gates will open at 12:00. The Wildcats take on Mt. Zion at 4:00. Merry Christmas, from the Wildcat athletic family to yours. Basketball is off for a while but don’t forget our Christmas Tournament 12/28&29. Games begin at 12:00 and the wildcats play at 4:00 both days.